As the MLS season approaches the midway point, Toronto FC’s revamped squad is still gelling. A string of new faces and the brief absences of Julio Cesar and Michael Bradley due to World Cup commitments have complicated a season of high expectations – but time is on their side. Ryan Nelsen’s men currently sit fourth in the Eastern Conference with games in hand; however, after beating San Jose in early June, the Reds are without a win in their last three games. That said, they have already recorded as many wins (six) as they managed in the entire 2013 campaign. There are different ways to evaluate this start to the season – but the message from a very upbeat Toronto FC dressing room is simple. “You’ve got to be consistent”, Jermain Defoe added. “If you want to be a good team, you’ve got to be consistent.” The striker was kept off the scoresheet in Saturday’s loss against DC United, but pointed to the importance of taking the positives from a game that Toronto FC controlled, especially in the second half. Using his omission from the England World Cup squad as extra motivation, Defoe has established himself as the main man in Toronto. His team-mates’ first thought when receiving possession is to look for a weighted pass over the top for the striker, whose goal tally stands at eight from 11 games – and he entered the weekend with five goals in his last six appearances. His partnership with Luke Moore, the striker who played in the Premier League for Aston Villa, West Brom and Swansea, is a work in progress, but the early signs are good. England’s loss has been Toronto FC’s gain over the past few weeks. But, make no mistake, Defoe has still been following events in Brazil. Toronto FC have upcoming games against Houston Dynamo and Vancouver Whitecaps, before getting another crack at DC United at the end of the month. And there is an outside chance that Nelsen’s squad could have an even stronger look to it by then, given the rumours that Toronto FC are chasing Frank Lampard, who played alongside Defoe for West Ham and England. A successful swoop for the former Chelsea man – though unlikely – would send shock waves around the MLS. Without question, the months ahead should make for gripping viewing. 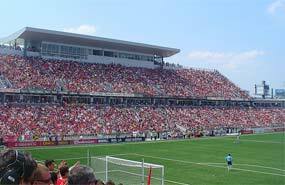 After the off-season spending spree, Toronto FC are expected to be battling for top spot in the Eastern Conference. With Nelsen`s squad gradually returning to full strength, this is the time to go on a winning streak. As Bradley said, the season starts now.